Introduction: As new approaches for cholecystectomy develop from laparoscopy to single incision or even natural orifice techniques, efforts to maintain safe surgical methods must be maintained. Cholangiography has been shown to minimize the extent of associated bile duct injury in standard laparoscopic surgery, but its role in other minimally invasive procedures is yet to be established. We propose that cholangiography in single incision laparoscopic cholecystectomy will be feasible and should be instituted as a routine rather than selective adjunct, to help decrease potential biliary complications related to altered fields of view and instrument handling. 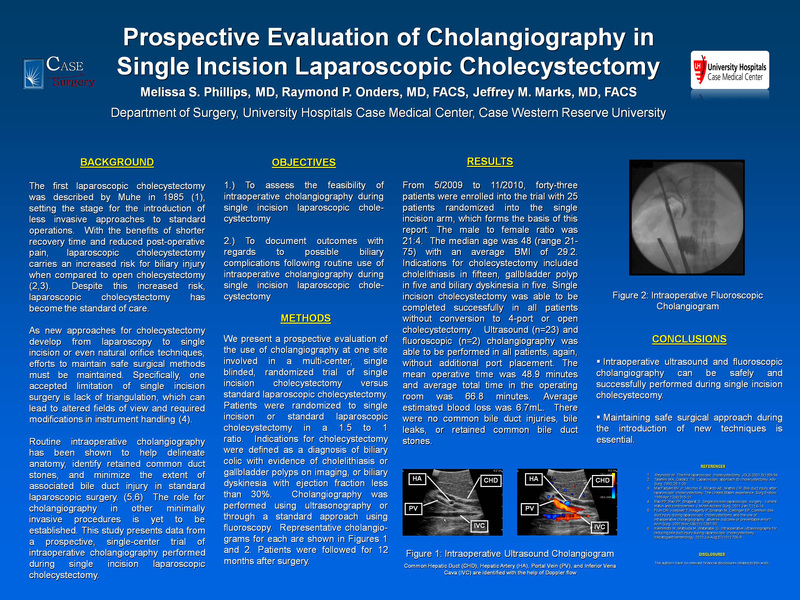 Methods: Prospective evaluation of use of cholangiography at one site involved in a multi-center, single blinded, randomized trial of single incision cholecystectomy versus standard laparoscopic cholecystectomy. Cholangiography was performed using standard approaches either by fluoroscopy or ultrasonography. Patients were followed-up in person for 12 months. Results: From 5/2009 to 9/2010, forty-one patients were enrolled into the trial with 24 patients randomized into the single incision arm, which forms the basis of this report. The median age was 49 (range 21-75) with an average BMI of 28.9. All patients underwent cholangiography without additional port placement. The mean operative time was 48.6 minutes and average total time in the operating room was 66.9 minutes. There were no common bile duct injuries, bile leaks, or retained common bile duct stones. Conclusion: Cholangiography can be performed safely and successfully in patients undergoing single incision laparoscopic cholecystectomy. As new operative techniques that limit triangulation and ideal visualization are introduced into the surgical arena, maintaining safety must be a high priority. We recommend performing cholangiography on all single incision laparoscopic cholecystectomies until the potential complication profile of this new procedure can be fully assessed.